If you Google “effects of early STEM education,” you will find pages of articles outlining the positive lasting effects of exposing your child to STEM concepts early, and throughout their development. Governments and school boards are continuing to focus more of their attention on STEM, and enrollment in STEM education programs has skyrocketed. Because it’s been shown time and again that early exposure to STEM (Science, Technology, Engineering, and Mathematics) can have a drastic effect on a child’s interests and eventual future career choices. Intuitively, that makes sense, right? How can a child grow up to develop the next big video game if they were never exposed to computers or coding? For the majority of us, it is our upbringing and early experiences that influence who we become as adults. Today’s tech giants are no different, and seem to have also been influenced by early childhood experiences. Before they were “Elon Musk” or “Susan Wojcicki” or “Jeff Bezos,” they were 10-year-old kids playing on the same playgrounds your kids are. Jeff Bezos showcased a maker’s mindset before creating Amazon. 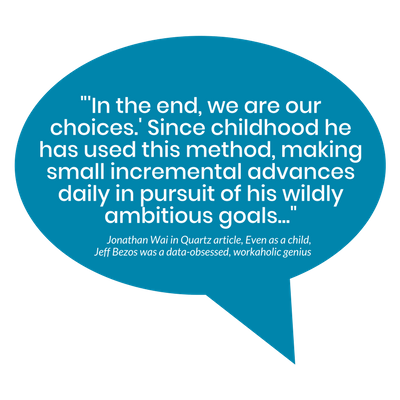 As a child, Jeff Bezos showed an early interest in STEM, following an innate interest in learning how things worked. After using a screwdriver as a toddler to take his crib apart, and then building his own electrical alarm system to keep his siblings out of his bedroom, he quickly earned a reputation around his household as a little inventor. He set up a “workshop” in his parents garage, where he would continue to build his own toys and take household items apart to see how they worked. In high school, Bezos further developed his love for technology and business when he started his first endeavor, the Dream Institute, an education summer camp for 4th-6th graders. Bezos went on to pursue his interest in computers at Princeton, where he studied computer science and electrical engineering. After initially pursuing - and succeeding in - a career in finance, Bezos would eventually quit to chase a passion of starting the online bookstore that would eventually become e-commerce giant, Amazon. Again, where did it all start? By tinkering, really. It’s probably not fair to say Bezos went from a young maker in his family garage to the richest person in history, because there was a lot that happened in between, including a stint at McDonald’s as a 16-year-old. The point is though, he made the most of each opportunity along the way, whether that was exploring the inner workings of the household items he was taking apart or becoming enamored with automation of the golden arches. Marissa Mayer used her focus on academics and extracurricular activities to push herself to the top of the tech industry. As a child and through her early years, Marissa Mayer was a dedicated student and took an early interest to math and science. This would continue throughout high school, where she excelled in chemistry, calculus, biology and physics. Mayer’s parents placed importance on extracurricular activities, with Mayer never having fewer than one after-school activity per day. Ballet, ice-skating, piano, swimming, debate, and Brownies as a child. In high school, she was president of her high school’s Spanish club, treasurer of the Key Club, captain of the debate team, and captain of the pom-pom squad. Download our 2018 brochure to learn more about getting your child started with STEM. Or, continue reading about today's tech giants! Mayer said in an interview that her mother intended to “overstimulate” her by surrounding her with many activities, and letting Mayer pick what she liked best. Her deep dive into science came after graduating from high school, when she was chosen to attend the National Youth Science Camp in West Virginia, a experience that greatly shaped how she thought about problems. She then went on to attend Stanford, where she intended to major in pediatric neuroscience, but later switched her major to symbolic systems, a major that combined philosophy, cognitive psychology, linguistics, and computer science. She would continue down this path, later receiving her Masters in computer science with a specialty in artificial intelligence. For her undergraduate thesis, she built travel-recommendation software. 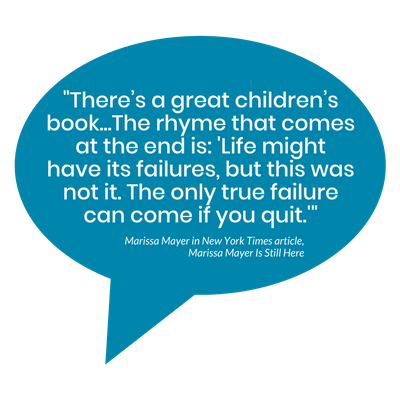 Upon graduation, Mayer had 14 job offers! She eventually decided to become the 20th employee, and the first female engineer at Google, later crediting the decision to the fact that she wanted to challenge herself. She helped develop many of Google’s search offerings, including working on Google Maps and AdWords. Thirteen years later, she was appointed president and CEO of Yahoo and became one of the most powerful women in tech. Although she is no longer the CEO of Yahoo, today, Mayer has big plans (although she has not disclosed the details). She has returned to where she began her career - by renting the same office where Google and Paypal started. The lesson here? Doors are opened with a background in STEM. From multiple job offers, to prominent roles with Google and Yahoo - and now the chance to pursue another tech endeavor - Mayer created, and is still traveling, a path flush with opportunity. Mark Zuckerberg created a messaging program at the age of 12. Mark Zuckerberg developed an interest in STEM at an early age thanks to a father who exposed his children to computers early on. At the young age of 12 years old, Zuckerberg used the programming language Atari BASIC to create a messaging program which he called “ZuckNet.” His father was an early user, employing the program in his dental office and around the house for communication. Of course, Zuckerberg didn’t stop there. He would use his new talent to build video games, using pictures drawn by his friends, just for fun. Self admittedly, some of the games were “terrible,” but it was his persistence that helped him get into programming! As Zuckerberg’s interests developed, his father hired a computer tutor to administer private lessons, but found his son’s knowledge quickly outgrew that of his tutor. While in high school, Zuckerberg further advanced his abilities by taking a computer graduate glass at nearby Mercy College. From there, it was Harvard for Zuckerberg, where he took mostly computer science courses, and eventually created what is now known as Facebook. Taking a step back, the talents and accomplishments of Zuckerberg are rare—we all can’t go out and build a “Facebook.” But, the principles hold true—he had the early exposure and resulting opportunities. When we give young minds the chance to explore a new skill, there is no telling what they’ll achieve, whether that’s creating the next great social media platform, a new app, a unique video game, a startup for social good, or something else of value. Elon Musk used an early interest in computers to become one of the world’s most prominent tech magnates. 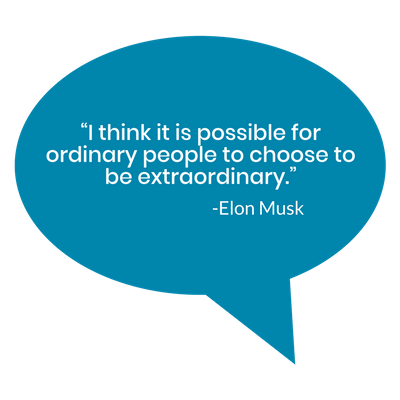 Elon Musk grew up in South Africa, and had a self-described “rough childhood.” However, he found an escape through his interest in computers and technology. In 1992, Musk began to study business and physics at the University of Pennsylvania, and after graduating from Penn, he moved on to Stanford to pursue a PhD in energy physics. However, due to a little thing called the internet and technology boom taking place at the time in the Silicon Valley, he dropped out after just two days. Musk would eventually launch his first company, Zip2 Corporation, and of course, has since assumed position as CEO of Tesla, and founder of SpaceX. In contrast to Zuckerberg, Musk didn’t have a parent hand down exposure to STEM. Instead, he pursued it himself, as an interest - to start - and then turned it into something tangible in his very own video game. His story is relatable in the sense that, anyone could learn to build a video game. And, the opportunities and tools at the disposal of today’s kids are more readily available then they have ever been. Larry Page took to his computer science pedigree to create internet behemoth, Google. Larry Page quickly developed an interest in STEM in his childhood home in Michigan in the 1970s, thanks to two parents deeply ingrained in computer science— his father, a pioneer in artificial intelligence, and his mother, a computer programming teacher. Both would prove to be instrumental in Page’s upbringing, sharing their computer science knowledge with him and encouraging him to pursue an education in the computer science field. Page earned a Bachelor of Science degree in engineering from the University of Michigan, and went on to study computer engineering at Stanford, where he met Sergey Brin. Together, the two developed the little search engine that could, forming what would come to be known as Google, now one of the most recognizable companies in the world. What stands out with Page’s story is the success that came from collaboration. Could he have gone on to big things on his own? He certainly had the makeup, but it’s something we will never know. What we do know for a fact, though, is that it was with a like-minded Brin, he was able to create something revolutionary and lasting. While the team came together after childhood, it’s a promising lesson for any child looking to get involved in STEM—surround yourself with others in the same boat to learn even more and gain synergies to take ideas to the next level. YouTube CEO Susan Wojcicki is one of the leading women in tech. Susan Wojcicki was born into a family focused on education — her father was a physics professor at Stanford, and her mother worked as an American educator and journalist. Both parents encouraged Wojcicki to explore the world around her, and develop a sense of independence. Taking to the advice, Susan would start her first business at age 11—selling “spice ropes” door to door. From there, Wojcicki attended college at Harvard, and majored in humanities, taking her first computer science class as a senior. She strove to build a career in academics, but after learning about technology and the possibilities of the tech boom, she changed her mind. Today, Susan is one of the leading women in tech, working as the CEO of YouTube (and an early advocate for iD Tech’s all-girls summer program, Alexa Cafe). Which brings us to a point that we cannot overlook—that we have listed six tech giants here and only two are female. That is a problem that is not only in this article, but is pervasive in our society and in the tech industry and STEM fields alike. 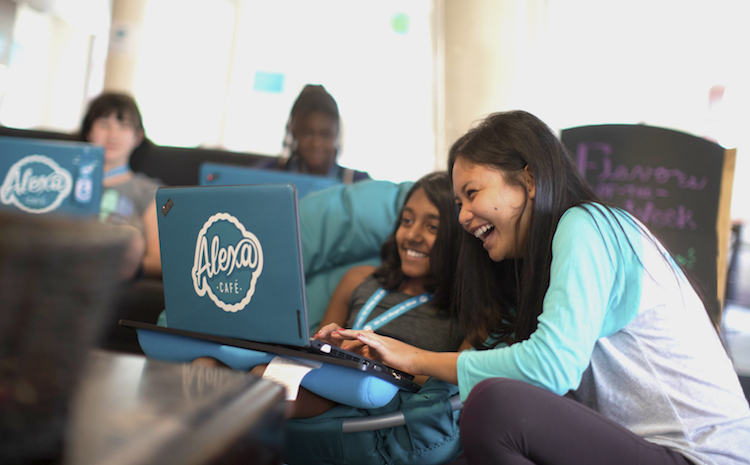 We are tackling the problem with Alexa Café, while also drastically altering the curriculum in our co-ed programs to ensure girls can enroll in courses that matter to them. So what do these tech visionaries have in common? They all showed early interests in STEM, and developed those interests throughout their childhoods and early education. Some were self-taught, and others benefited from parents already in STEM fields, but either way, early exposure seems to have instilled the confidence needed to pursue future careers. .
“We as a society need to get to a point where everyone has the same opportunity and the same ability to be playing with technology and experimenting with different things, because that's how you eventually get into engineering. You learn and you mess around with things and design some things." But, did you know that we also reserve 10% or 7,000 seats for underprivileged students to better serve a wider breadth of families? Getting back to your child and STEM—what will it take for your child to become the next Susan Wojcicki or Jeff Bezos? Well first, it takes foresight. All of these individuals took advantage of the opportunities that were presented, sometimes even moving across the country to become early players in the tech boom! Next, it takes exposure. As these stories show, a lot can stem from a curious mind or an entrepreneurial spirit. While everyday schooling may not be the best at fostering such interests, summer programs like iD Tech provide children with the perfect opportunity to explore new interests or further develop existing ones—all in an environment that is fun and exciting. Lastly, it takes internal Drive (what the “i” and “D” stand for in iD Tech), and the mindset that anyone can be successful with enough motivation. Sarah recently joined the iD family as a marketing associate. This Cal Berkeley alum (go bears!) is a proud doggie mom, fanatical fantasy football player, lifelong foodie, and travel addict. When she is not daydreaming about her next travel destination or taking pictures of her adorable dog, she can be found in her kitchen, creating her next delicious recipe.